Everyone knows that the holiday season is not complete without the decorations. Hence, it's likely that you'll be getting a few for your family. Before you purchase anything, you might want to check out Christmas tree inflatables. Let's face it, while a Christmas tree is a necessity for the Holidays, it can also be a real hassle to set up. At the very least, you need to trouble yourself with getting a tree and lots of ornaments. With inflatables, it's a hassle-free endeavor as you only need to plug it in, turn on the fan and that's it. In this article, you'll find a good selection of Christmas tree inflatables. Whatever you're looking for, you're likely to find it in the list below. Skip the old boring Christmas tree. Why not try something that is more festive and funky. Thankfully, with this Christmas tree, you can do that. First of all, this inflatable Christmas tree stands at 8 feet tall. Hence, the size is impressive enough to get some "wows" and "ohhhs." However, that's not the most remarkable part of this item. 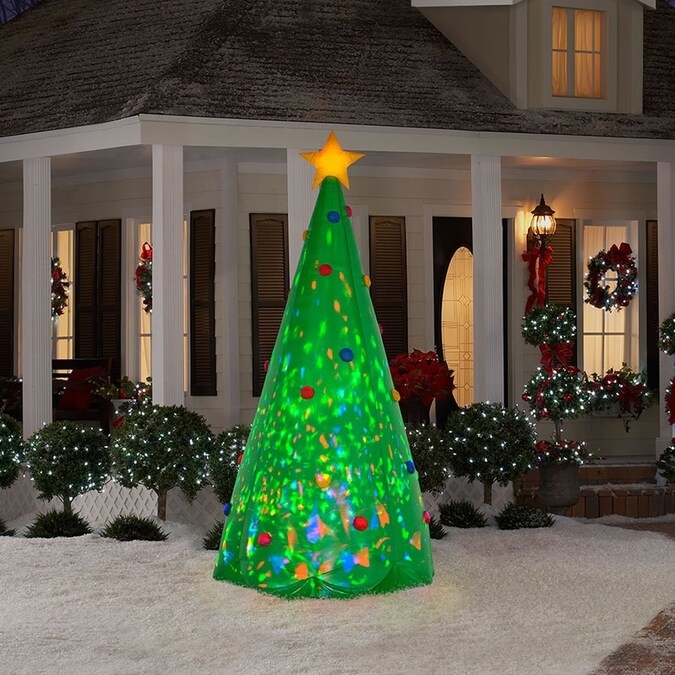 This inflatable Christmas tree comes with internal lights that project a kaleidoscope of colors. The lights also move. It's like the Christmas tree is having its own dance party. Aside from being festive, the lights are LED which makes them very energy efficient. You don't have to worry about the electricity bill bringing you down after the holidays. If you think you're front lawn is a bit too dull for the holiday season, then this inflatable Christmas tree can undoubtedly change that. This inflatable stands at approximately 5 feet tall. It's a perfect size for the front lawn. It features a design that comes with a Christmas tree, a bright yellow star on top, the holiday gifts at the bottom and tree ornaments. It's both fun and festive. The inflatable is crafted from weather resistant material. Its strong enough to withstand the elements and snow. The product also comes with internal lighting. With it, your Christmas tree lawn will not only look festive, but it will also become a beacon of joy. The item can be inflated in seconds. When the holiday season is over, you can deflate it and store it almost anywhere. What's better than a Christmas tree? A Christmas tree together with Santa Clause, and that's what this inflatable is all about. Furthermore, you can use this item either in or out of your home, and that's because it's crafted from very durable materials. The Christmas tree is also internally lighted. This means that this Christmas tree even looks better during the nighttime. In fact, it looks great that you can use it as a family photo background and you won't be embarrassed about it. Aside from being durable, the material is also lightweight, so it's easy to operate. Almost anyone can set it up and deflate it. It also flattens to a compact size, making it easy to store. This inflatable Christmas tree is not only great as a decor, but it's also hilarious. Aside from the tree, it features Santa Clause clinging for dear life while a dog mischievously pulls his pants down. This inflatable is sure to bring out a lot of laughs. Aside from the funny setup, this inflatable also does not fall short when it comes to the functionality features. For example, it's a lighted inflatable which makes it a great nighttime decor. It's also self-inflating. Almost anyone can inflate the item as you only need to plug it in. The product is also crafted from weather-resistant polyester. It's an inflatable that's durable enough for the outdoors. You can't have proper holidays without a Christmas tree. Fortunately, you can start decorating for the season of giving with this one-of-a-kind Christmas tree inflatable. Standing at around 8 feet tall, this inflatable is nowhere the term short. Most importantly, its self-inflating which makes it effortless to set up. It features unique-looking lights that appear to be snow hanging on the leaves and branches of the Christmas tree. Despite being tall, this inflatable is easy to operate. And, that's because it's crafted from lightweight materials. The tree is already good enough as a stand-alone decoration. Or, you could pair with it other Holiday decorations. If you want a hassle-free Christmas tree addition, then this item is one of your best choices. This Christmas tree is sure to delight children of all ages. Forget about the hassles of setting up a regular Christmas tree and all of the ornaments. With this single inflatable, you are already covered with the tree, presents, topper, and decorations. This Christmas tree also inflates itself. There's no need to blow or pump air into it. All you need to do is plug it into an electric outlet, and that's it. The inflatable will take care of the rest. It looks great as it's effortless to operate. After the holidays, you'll also have no problems when it comes to storage. The same can't be said for the regular Christmas tree which requires disposing and storage of the ornaments. This inflatable can collapse which makes it very easy to store. When you talk about the Holidays, most people would include a Christmas tree, Santa Claus, and a snowman. So why not get a Christmas tree with those characters. Thankfully, you can with this single inflatable. This holiday decoration is sure to be a delight for both the children and adults. Furthermore, Santa Clause and the snowman is ready to give a wave for your guest and family members. It's the perfect decoration if you are looking for something that's not too serious and whimsical. The entire item is crafted from durable materials, so you don't have to worry too much about accidentally ripping the inflatable. It also features internal LED lights which makes it a great decor during the night while being energy efficient. This inflatable is perfect if you are looking for a Christmas tree decoration that aims to entertain your friends and family. It features a hilarious scene that includes Santa Clause getting bitten by a dog while he is placing a present under the tree. It's a picture that is sure to bring out a couple of laughs. Aside from the funny setup, this inflatable also comes with everything you need. It features an internal light to enhance the visual appeal of the decoration. Also, the package already includes tethers and stakes to ensure that your funny decoration stays in place. The item also comes with a powerful fan, which allows itself to inflate in a couple of seconds. It's a decoration that is both entertaining and very functional. If you think that a Christmas tree is not enough, then you can get one with a holiday greeting. This inflatable features a big "Merry Christmas" greeting to your friends and family. The item also includes internal lights to ensure that everyone can see your Holiday greeting. In fact, it's the perfect decoration to add in your frown lawn as you may uplift the mood of onlookers. After all, holidays are a season for spreading of love and joy. Furthermore, you don't have to make a lot of effort as the item comes with an internal blower. Once plugged in, it can set itself up in just seconds. The package also includes ropes and stakes. This is to ensure that your decoration stays in place to greet anyone. On top of that, the item is crafted from Oxford fabric. It's strong enough to endure the outdoor elements. Standing at 8 feet tall, this inflatable Christmas tree is sure to grab the eyeballs of your guests. The item already features a complete holiday tree including the presents, toppers, and ornaments. It's a one-stop solution for your Christmas tree decoration needs. Aside from its all-inclusive design, this inflatable can also light-up. It's a perfect decoration for the front and backyard, especially during a nighttime setting. It's also made from a weather-resistant material, so you don't have to worry about the elements too much when it's exposed in the outdoors. The item already comes with an internal fan, which means it can self-inflate on its own. It's a Christmas tree that is both eye-catching and effortless to use and operate.